CLEVELAND -- Well, that ought to put an end to the notion that the Boston Celtics are a better team without All-Star point guard Isaiah Thomas. For much of the first half of Tuesday's Game 4 of the Eastern Conference finals against the Cleveland Cavaliers, it might have been OK to ponder that suggestion. After all, the Thomas-less Celtics had rallied from 21 points down for an improbable Game 3 victory two nights earlier and Boston might have played its best basketball of the series over the first 18 minutes of Game 4. The Celtics were spectacular at the start of Tuesday's game. Boston zipped the ball around the court while generating 17 assists on 21 first-half makes. Boston limited both its turnovers and Cleveland's second-chance opportunities. Maybe most startling of all, the Celtics got LeBron James into early foul trouble. In that moment, with a double-digit lead and James going to the bench with more than six minutes to play in the second quarter, Celtics fans could daydream about the series coming back to Boston tied 2-2. A win would have restored home-court advantage for the Celtics, while the Cavaliers might have been questioning themselves. So how, exactly, did the Cavaliers burst that bubble? "Kyrie Irving and LeBron James would be the two answers," Celtics coach Brad Stevens said. Irving and James paired up for 48 second-half points, topping the scoring output of Boston's entire roster by six in that span. The Celtics reverted to bad habits -- turnovers, rushed shots, haphazard rebounding -- and watched Irving and his game-high 42 points rally Cleveland to a 112-99 triumph at Quicken Loans Arena. The Cavaliers own a 3-1 advantage in the best-of-seven series and can lock in a much-hyped NBA Finals rubber match with the Golden State Warriors with a win Thursday night. Boston's second-half struggles juxtaposed to the dominance of Irving and James essentially spoiled the hopes of any sports yakker who was preparing to sound off about Thomas. Game 3 reminded us that Boston can be competitive, but its lack of elite talent is simply more pronounced against a team like the Cavaliers. The Celtics needed someone they could lean on in the fourth quarter. Al Horford did his best for a stretch, and his back-to-back buckets had the Celtics within six with under six minutes to play. But there would be no clutch baskets, no watch taps, no proclamations that fans inside The Q knew what time it was. The Celtics had missed their initial chance to extend their 10-point lead when James picked up his fourth foul with 6 minutes, 46 seconds to play in the second quarter. It should have been a chance for the Celtics to really pad their lead before James could return at the start of the third quarter. Instead, it was the start of Irving's takeover. He scored Cleveland's next 10 points and Boston needed a couple of layups in the final minute of the first half just to restore the 10-point advantage it had when James checked out. Asked if he felt his team missed an opportunity to stretch its lead with James off the court, Stevens was quick to point out the benefits of a talent-gushing roster. "They still have two All-Stars out on the court," said Stevens, referencing Irving and Kevin Love. "With the best player in the world [off the court, it's] unreal, but they're still a pretty darned good team when those guys are out there." The Celtics smothered Irving with praise and suggested there are simply nights when the NBA's best players are capable of taking over on a big stage. But you can't help but wonder if things might have been different if the Celtics had Thomas to steady the offense when it endured brief scoring lulls. Remember that, during the regular season, the Celtics owned an offensive rating of 113.8 with Thomas on the court, or a half-point better than the Warriors' much-ballyhooed offense. Yes, Thomas has defensive deficiencies because of his 5-foot-9 stature, but the Celtics so very much need him to consistently generate points. Even James -- who overcame foul trouble and a missed breakaway dunk to finish with 34 points on 15-of-27 shooting -- admitted the Celtics just are not the same without Thomas' presence. "They're a different team when I.T. is -- I won't say a different team, they run different things just because of I.T. being a huge piece of the puzzle for them, offensively," James said. Without Thomas, you can make the case that the Cavaliers have the three best players remaining in this series (though Horford could make a case for one of those spots), including James, whom Stevens keeps referring to as "the best player in the world." James praised Stevens, too, but the talent disparity has simply been too much for even Boston's coach to overcome. For key stretches late in the third quarter, the Celtics leaned heavily on players like rookie Jaylen Brown, second-year guard Terry Rozier and center Tyler Zeller. Clearly, not having Thomas and the trickle-down effect on the roster has an obvious impact. James gushed again about Stevens' after-timeout plays and how they are among the most creative plays he has seen and how they've routinely given the Celtics quality looks. James essentially credited Stevens for helping Boston remain competitive. "So they had to kind of reshape [without Thomas] and that's the beauty of having Brad Stevens as your coach," James said. "You're able to reshape what you do offensively and still be in a good rhythm. It's been challenging for us to kind of -- plays out of timeout, [they've] kind of been killing us on ATOs and keeping us off-balance, but in the second half we kind of got a little bit of rhythm and think we'll be better in Game 5." The Celtics have repeatedly stressed that Thomas is out for the remainder of the postseason no matter how long this series lasts. Which means that if Boston is to truly make things interesting and prolong its season for at least another few days, it'll need players to step up and show poise on a big stage. As Irving and James went to another level Tuesday night, the Celtics had no one who could quite match them. To the credit of Boston's players, they refused to use Thomas' absence as an excuse for why the team is on the brink of elimination. 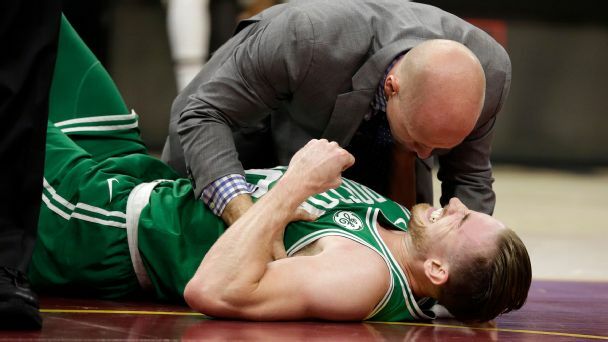 Instead, the Celtics embraced their adversity. They've routinely thrived in tough situations this season. They'd also like to atone to their home crowd for two forgettable performances to start the series. "We're humble enough to know that we haven't played well at home, and we want to give our home crowd a better outing than we did the past two games," Jae Crowder said. "We're right there where we want to be, we're locked in." Still, the gap between a locked-in Celtics team and an engaged Cavaliers squad might be too wide to overcome. It's fair to wonder how much different things would be with a healthy Thomas. While acknowledging that Boston is without its leader, Avery Bradley, who led the team with 19 points, hopes it can rise to the challenge in Thursday's Game 5. "We owe our fans a better performance, and we know that. And we're going to play hard," he said. "You're going to see a team playing hard, very hard, the entire game." That alone might not be enough. The Celtics could really use a superstar like Thomas.